Graham Parker Live In San Francisco 1979 captures Parker live in concert with his great band The Rumour on the Squeezing Out The Sparks tour. Graham Parker should have been huge with his high energy, caustic R&B inspired songs. Even though it was the time of punk rock, few acts could match the intensity he built up in concert. 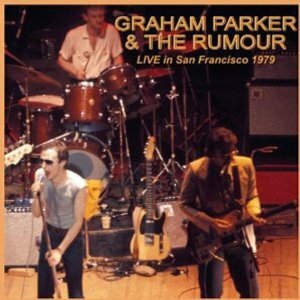 Graham Parker & The Rumour really were “the best kept secret in the West” as he sings in Mercury Poisoning as he rants against his previous record company. I believe this album was only released in 2010. I bought it as soon as I saw it. My Overall Rating – 28 out of 30 – an excellent live album that should not be overlooked. Ten songs from the great Squeezing Out the Sparks album and four from the previous Stick To Me album means that this set list is very different from the earlier Graham Parker & The Rumour live albums Live at Marble Arch and The Parkerilla. What remains consistent over these albums is the intensity and passion of the performance. Listening to Graham Parker live is thrilling. Bruce Springsteen allegedly said that Graham Parker was the only artist he’d pay to see live. That’s how good he and his band were. The band rocks hard and insistently as it rattles through the set list. There’s no let up at all. Here are some videos of Graham Parker performing live in 1979 so you can get a feel for the magic. I love listening to Graham Parker and I wish I’d seen him in the late 1970s. I don’t have any memories of him touring near me. There’s no doubt that you’re listening to a live album and Graham Parker and the Rumour were still very much in their hot streak which lasted through another studio album, The Up Escalator. However the weakness is that there’s little interaction with the crowd and you don’t get to hear Parker’s personality. I believe that this is one of the greatest live albums ever released. I think it’s terrific and it’s the best of a good bunch of live recordings from Graham Parker. The world missed a master when it decided to overlook Graham Parker and the Rumour. Graham Parker was cool in 1976 just before punk rock exploded when critics raved about his first two albums Howlin’ Wind and Heat Treatment and Squeezing Out The Sparks represented another critics favourite in 1979. Unfortunately I haven’t seen Graham Parker records on any greatest live albums lists. Live he is hot and steaming. Fortunately there is a bit more sense in the Amazon reviewers. What Do You Think About Graham Parker Live In San Francisco? I love this record although it is a tough decision to decide which is the best of the early Graham Parker & The Rumour live albums. What Are The THREE Best Live Albums By Graham Parker?
? 80's Reverb Rules Ok! Please vote in my poll to find the best live albums by singer-songwriters. This entry was posted in 1970s Live Albums, Proto Punk & Pub Rock Live Albums, Singer Songwriter Live Albums and tagged 1970s Songwriters, 1979 live albums, 28, Graham Parker Live Albums, SS P by Paul Simister. Bookmark the permalink.